Celebrating Shabbat is a highlight of our week. We encourage you to come for any part of a service—to sing, pray, or even just schmooze and nosh. After all, Shabbat is a time for people to reach out, make new friends, and renew connections. Our Friday night services, offered every first and third Fridays, are a mix of Hebrew singing, D’var Torah and English readings. In our longer, mostly Hebrew, Saturday morning service, we sing songs of praise, read Torah, and dive into inspiring d’var discussions. On every First Friday Night, a communal Shabbat dinner precedes the short and sweet service. And one Saturday morning a month we hold our joyful, musical celebration, Shabbat Shirah, along with Tot Shabbat, a fun-filled, musical service for our little ones. Our prayer books are designed to reach a wide audience. They are fully transliterated and translated and offer alternate readings—so everyone can join in. 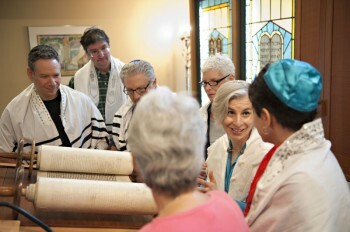 And our services are led by lay leaders as well as Rabbi Jen—so, with rabbinic guidance, anyone can participate. First Friday Night Shabbat Dinner & Service 6—8 p.m.
We usher in Shabbat on the first Friday of every month with a casual dinner (on us) filled with traditional rituals – like candle lighting, gratitude acknowledgements and blessing the challah. Following the dinner, Rabbi Jen leads the short and sweet service. Third Friday Lay-led Shabbat Service ( Beginning January 2018) 7—8 p.m.
Every third Friday of every month, our members themselves spread Shabbat joy – as well as supply irresistible Oneg desserts. Rabbi Jen will still be on hand, for the D’var Torah, and services are lay-led. Songs of praise. Reading of Torah and Haftarah and a lively d’var discussion. Kiddush luncheon follows. Monthly Shabbat Shirah Service 9:45—11:45 a.m.
Once a month our Saturday Morning Service becomes a song-filled, musical celebration with singing, dancing, guitar, a big dose of ruach. It’s how we provide another gateway to prayer. Kiddush lunch follows. Through wiggling, singing, and dancing, families with preschoolers (infants to age 5) share in learning the basic liturgy as well as singing traditional Shabbat songs. Kiddush lunch follows.